In the Book of Mormon we read about Lehi and his family. Heavenly Father led them to a new home in a choice land. 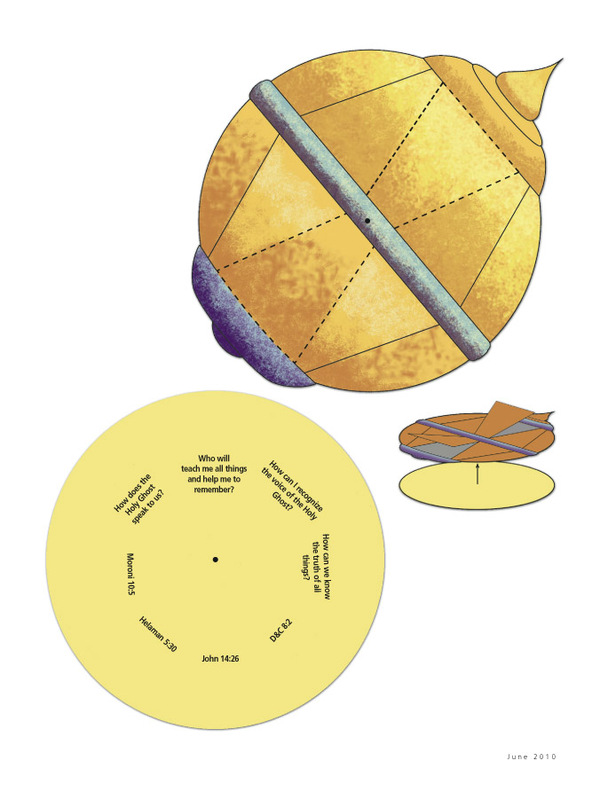 Lehi received a marvelous gift from God: a round ball with two spindles that “pointed the way whither [they] should go” (1 Nephi 16:10). This gift was called the Liahona. Nephi said the Liahona “did work according to [our] faith and diligence and heed” (1 Nephi 16:28). Lehi’s family learned to follow the directions of the Liahona. We receive a marvelous gift when we are baptized and confirmed. This is the gift of the Holy Ghost. The gift of the Holy Ghost is like the Liahona. We can learn to follow the Holy Ghost. If we follow His promptings, we can return to live with Heavenly Father and Jesus Christ again. Pray to Heavenly Father to know that the Holy Ghost will help you. Help someone else memorize Moroni 10:5. Remove the Liahona activity on page 65, and mount it on heavy paper. Cut out the circles and the two sections within the broken lines. Attach the circles with a metal fastener. Read the question in the cutout area, and find its answer in the scripture reference in the opposite window. You can write your answers in your scripture journal. Write in your journal about some times you have felt the Holy Ghost. Recognizing His help in the past will help you listen to and follow His promptings in the future. Talk to your parents, teachers, or friends about times they have been led by the Holy Ghost. Write in your journal or draw a picture about what you have done. How does what you have done help you understand Moroni 10:5? Who will teach me all things and help me to remember? How can I recognize the voice of the Holy Ghost? How can we know the truth of all things?